Lay betting allows you to play the role of the bookmaker. 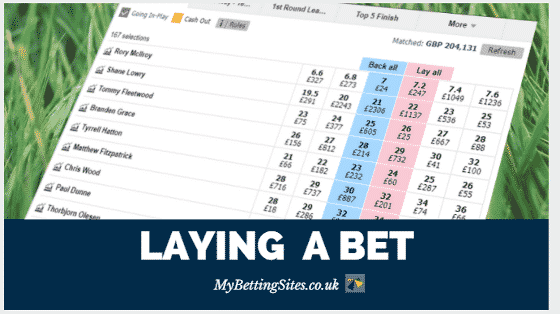 Rather than backing a selection to win, lay betting enables you to bet on something to not happen. For instance, you might think Liverpool with their defence has no chance of winning the Premier League. At the same time, you might not know who will win the league. In this instance, a lay bet might be right for you. Lay betting would allow you to bet that Liverpool does not win the league. If anyone else wins the Premier League, then you win your bet. If Liverpool does win the league, then, of course, you would lose. Liability is an important concept to understand when learning about laying bets. When you conventionally back a horse to win, the amount of money you can lose is your stake. I.e. 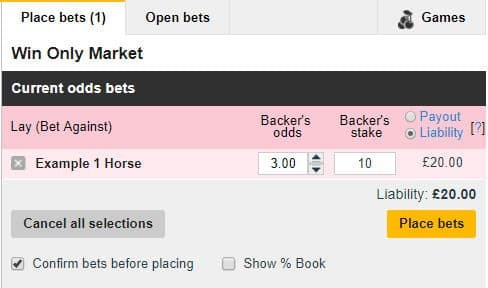 if you bet £10 on a horse to win, and it comes 3rd, it is only £10 you can lose. It is different for lay betting. Think of yourself as the bookmaker. If you lose your bet, the bookmaker keeps your stake. If you win, then the bookmaker has to pay out your winnings. It can be a lot more than your original stake. This is same as laying a bet. If the selection does win, you have to pay out the winnings. That potential payout is known as your liability. It how much you need to pay out if you lose your bet. 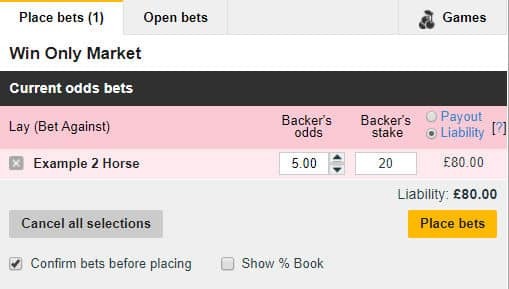 In this example, if any other horse wins, then you win the losing stake of £10. The horse is priced at 3.00. If the horse wins the race, then your liability is equal to the winnings for the backer. This is £20. It is only the winnings you pay, as the backer’s original stake is returned to them. In this example, if any other horse wins, then you win the losing stake of £20. The horse is priced at 5.00. If the horse wins the race, then your liability is equal to the winnings for the backer. This is £80. It is only the winnings you pay, as the backer’s original stake is returned to them. We wanted to put in this example since it shows how liability can quickly grow. In this case, laying this bet would generate a potential return of £10. 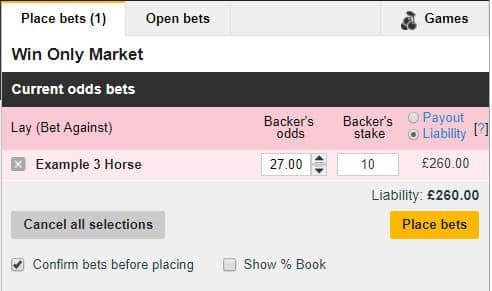 At odds of 27.00, probability dictates that this horse is unlikely to win, but if it does, the liability is £260. When laying bets at high prices, one has to consider whether the chance of gaining £10 is worth the risk of losing £260. The term ‘laying off a bet’ sounds similar, but is different. Laying off a bet refers to betting against something you have already backed. Let us explain further. You back Newcastle at 8.00 to beat Chelsea before the match starts. During the game, they take a surprise 2-0 lead. The odds for Newcastle win this game have become shorter. You can choose to now lay off this bet. By laying the same bet as you back, you are betting both on it to happen, and for it not happen. Because the odds have got shorter, you are guaranteed profit for doing so. This is similar to cashing out your bet earlier. Laying off your bet allows you to take reduced, but guaranteed winnings. Be cynical of anything which guarantees, or promises winnings when it comes to lay betting systems. There is a very small possibility that they do exist. Perhaps through sophisticated algorithms, someone has managed to create one. It is more likely however historical performance is fake. Newspapers in the UK have uncovered high profile Twitter accounts doing precisely this. People who claim to have created such systems are making money from selling them. When you lay a bet, you are betting on something to not happen. If the selection does indeed not win, then you win the backer’s stake. If it does however win, then you pay the winnings. This is known as the liability, i.e. how much you will potentially have to pay out.